On May 24, 2016, the 2nd edition of the 3D Design & Engineering Conference will take place at Designhuis, in Eindhoven, The Netherlands. 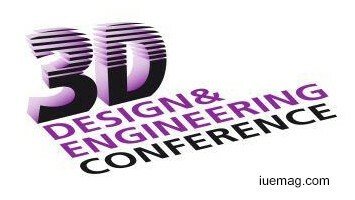 The 3DDE Conference offers design and engineering professionals the chance to learn and meet the possibilities of 3D printing, and to look at design challenges from different perspectives. The topics that will be discussed include: The 3D printing value chain | Visualisation tools, 3D design & 3D engineering tools | Virtual Engineering | 3DDE education and studies | Creative thinking in the design process | Reverse engineering of 3D products. The following speakers have already confirmed their presence: Claire Barker, territory manager for Benelux, Stratasys | Dr. Kristian Arntz, chief engineer, Fraunhofer-Institute of Production Technology / managing director, Aachen Center for Additive Manufacturing (ACAM GmbH) | Ernst-Jan Louwers, Attorney at Law/ Founding Partner, Louwers IP|Technology Advocaten | Mark Rahusen, Founder, EDS Innovation | Kaye Hope, COO, ShareMy3D | Thomas Bossuyt, Mechanical Engineering (Founder), Metal Technics 3D | Simon Vermeir, Design engineer additive manufacturing – 3D printing, Sirris | Mathieu Huard, Co Founder, ShapeDiver. Any facts, figures or references stated here are made by the author & don't reflect the endorsement of iU at all times unless otherwise drafted by official staff at iU. This article was first published here on 15th April 2016.